What could be nicer than a family picnic in the park or a short walk in the woods with your little ones? You all trek out, packed sandwiches and all, looking forward to fresh air, trees and lots of fun. But just when you thought the day was going to be epic, a barrage of mosquitoes ruin it for everyone. It’s a challenge keeping your baby safe from these annoying critters because it’s not likely you would be comfortable slapping on just any insect repellent which often contain harsh chemicals on your precious child. Aside from their sensitive skin, some of these chemicals may be harmful if it gets to critical body areas such as the eyes and the mouth. Most parents opt to look for all-natural or organic bug sprays over insect repellents containing DEET. There are mosquito repellent bracelet options available which seems safer, but can be quite challenging keeping on an infant younger than 1 year. DEET (the primary component of popular products like Off insect repellent) is much maligned in the mosquito repellent universe because it is a chemical and must be used with caution when using on children younger than 3 years old. However, no one can question that it is so far the most effective ingredient used to keep the bugs away. Recent studies have shown that DEET is safe for application on skin for adults, and if used in the right amount, safe for children as well. The amount of DEET may differ from product to product so do be conscious of not using one that has more than 30% DEET on young kids. Insect repellents are not recommended at all for children than younger than 2 months. A quick search on the internet on best mosquito repellent for babies will show that organic and natural reigns supreme. Not all organic bug spray or natural bug repellents are created equal though. Some popular ones claim to shoo little insects away like mosquitoes and gnats, but actually attracts other larger insects due to the use of essential oils too hard for them to resist. Meanwhile, some natural insect repellent contains Oil of Lemon Eucalyptus which can sting the eyes of your little ones. To make it easier for you, we at ParentsNeed HQ have lined up the top 5 best bug repellent for babies. We made California Baby Citronella Bug Repellent Spray our top choice for the best baby bug spray out in the market because it has been proven safe to use on children of all ages (although it is recommendable to ask the doctor first before using it on infants younger than 6 months). It is gentle, hypo-allergenic, non-toxic and DEET-free. Gone are the days of stressing over acceptable percentages of chemicals and additives since this product made sure all ingredients are organic and bio-friendly. It may be a bit of a challenge to find in local stores, but it’s worth foraging the shelves for. It will keep your baby bite-free if used and applied as instructed in the product’s packaging. It is easy enough to find and order on Amazon where it’s almost always on stock. You will find that it is good value for your money, and you may even find yourself stocking up on it to avoid running out of supply ever again. Just keep it mind that some people find it so mild they feel like it doesn’t work for their babies at all. This is easily remedied by making sure that the product is applied liberally all over the body and reapplied often enough to make sure that those bugs won’t find any weak spot. If you want to be sure that using the product will not cause your child’s allergies to flare-up, do a patch test to check. You should also consider spraying some on their hair for head-to-toe coverage. This bug spray is made from vegetable and plant-based ingredients sans chemicals and irritants, and it smells faintly but pleasantly of citronella with hints of cedar and lemongrass. No wonder then that aside from mosquitoes, it also repels fleas, ticks and biting flies. And in case there are already existing bites on baby’s skin, it soothes and cares for it until it heals. It is possible that we have not underlined all the good things about California Baby’s bug spray yet but it might be better if you can go out to your local store and grab one to find out for yourself if it is indeed the best bug spray for babies out there. If you are concerned about the use of exclamation points and capitalized letters on the name of this product, be assured it’s only because one can’t help getting excited about how well it works. Spray it on your baby, your toddler, your spouse and even on your grandmother, and BALM! Baby. It works! It’s easy to spray on the skin, clothes or surroundings; it’s convenient, organic and it’s natural. The makers of this product can tell you quite a history of their products too. It seems that Balm! Baby do not just aim to give us natural and organic products. They aim to provide us with the best natural mosquito repellent that the whole world will eventually thank us for using. It is so eco-friendly and responsibly-sourced it’s sure to assure even the greenest Mom and Dad in the world. And did we mention it’s formulated and made in humid and exotic Hawaii which is probably no stranger to irritating bugs common in tropical places? All the ingredients (which includes witch hazel, neem oil, and extra virgin olive oil) come from a local organic farm. It’s certified Vegan, Gluten and Nut Free, Cruelty Free and all packed up in an environment-friendly bottle. We tell you, this product is just one of the many baby-safe products all of which are responsibly sourced and ecologically sound. It’s not just ultra-hipster, it is très effective too and that’s why we chose it as the 2nd best baby-safe insect repellent in the market today. When applied, it does not leave an oily, sticky feeling which is perfect for those balmy days in the great outdoors with your baby. It smells so good that it won’t have to be a great battle of wills between you and your child just to put it on. Unless your child has special skin conditions, this formulation is mild and safe for daily use. It also leaves a cooling effect that can instantly calm a fussy child trying to enjoy some fresh air during spring or summer time. No wonder a lot of parents consider this as one of the best bug spray for kids. Not all days are a walk in the park. Some days are heavy-duty monster truck days where you have to be prepared for just about anything. It would be nice if the possibility of your babies being bitten by mosquitoes or insects carrying all kinds of gruesome disease will not be one of your worries anymore. We make Herbal Armor our third go-to choice for those extra adventurous days. It is clinically-proven to be 100% effective for two hours and 95.8% effective for another extra hour. Compared to other safe mosquito repellant for toddlers and babies, that means less re-application until at least the 2 or 3 hours is up. It is water and sweat-resistant so children can run around all he or she wants and still be protected. Certified to be non-irritating and safe for even the most sensitive skin, it can be used as often as necessary. When sprayed on clothing or equipment, it won’t leave an oily sludge or stain that can damage it beyond repair. When sprayed on skin, it is rubbed in like lotion and is absorbed by the skin in a few minutes. It does smell of citronella and can come on strong which is why it is only 3rd in our list. It is however not irritating and unlikely to cause allergic reactions even to the most sensitive kids. It can even be applied on the face although it is best to make sure that the eyes and mouth are avoided. All Terrain Kids Herbal Armor is 100% cruelty-free with no animal-testing and comes in 4 oz. and 8 oz. bottles with leak-proof cap. It does ease worries a bit when you know that a product is used and loved by thousands of other parents worldwide. Regardless of where you are in the world, whether you and your kids are living in California, visiting grandma in London or vacationing in Cuba, you are covered by the best insect repellent for the family. Don’t take our word for it. This product has been featured by Popular Science Magazine and named Best Gear of the Year by National Geographic Adventure and they can tell you a good thing or two. 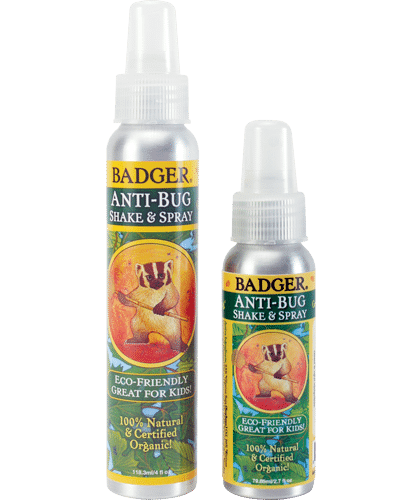 Aside from having a cute, feisty Badger as a mascot, this natural insect repellent claims to be “good for the skin and bad for the bug.” It means business too as the mascot holds up what seems like a wicked-looking broom. It keeps critters away from your babies and the rest of the family with its effective formula of Citronella, Rosemary and Wintergreen essential oils. Badger’s products are laboratory-tested and proven to be safe with high efficacy. To soothe over-anxious parents, it does emphasize that it contains no DEET, petroleum products or synthetic chemicals and comes in an easily recyclable aluminum bottle. One must remember to shake the bottle before spraying though because the liquid contains no binders and a good jiggle will make sure that all contents are distributed evenly when applied. Spray directly on skin for better results and reapply as needed. If your baby’s skin is sensitive, it is always wiser to test it on a small patch of skin first before using on other parts of the body. Essential oils are known to irritate the skin once in a while, but the maker of this product assures us that the percentages of oil in this baby-safe bug spray are balanced. Just be careful and avoid spraying it over broken skin or eyes because you can imagine how that might still sting! Ouch! One more thing to like about this shake and spray insect repellent is that it smells nothing like chemical-based repellents. Some people describe it as a mix of a fresh citronella smell, which would fade off into fainter citrusy smells and won’t knock out anybody standing near you or your baby. Some babies have a bit more sensitivity to smell and some have allergies easily irritated by smells, so do take heed. This repellent works well as an infant bug spray but is best used with the knowledge and approval of your child’s pediatrician. The Badger Balm also comes in a moisturizing organic salve form. Although lesser known than the previous products, Lafe’s Organic Baby Insect Repellent is a Whole Foods superstar and favored by people who just cannot stand citronella at all. What’s not to like? This baby bug spray is USDA certified organic, chemical and DEET free, fragrance free and vegan. What makes it a bit more unique than the other citronella-based baby mosquito repellent is that it uses a special formulation of geranium and lavender essential oils that naturally drives away insects. Being fragrance-free is definitely a refreshing change from what can sometimes be a cloying and overpowering scent coming from other natural infant mosquito repellent. No chemicals and no smell ensures that baby’s sensitive skin is protected even if the product is sprayed directly on skin. When sprayed on fabric, it does not stain and does not damage equipment as well. It should be sprayed on baby every 2-3 hours generously, covering all exposed areas of the skin. With the advent of concerns about how plastic can affect an infant’s endocrine activity, it is reassuring that all of Lafe’s products come in special baby-safe material that works to reduce exposure to endocrine disruptors which are made so abundantly in the conventional plastic formulation. They have committed their company to this because they believe that we have to say that it feels good to know that what’s going into our bodies aren’t laced with dubious chemicals and other mystery ingredients. Aside from geranium and lavender, Lafe’s Organic Baby Insect Repellent also contains cedar wood, eucalyptus, lemon and almond oil. These combine together to form a non-greasy and light bug spray for babies that feels like it’s barely there, making it the best product to round up the top 5 baby insect repellent available. So before bugs decide that your baby tastes like dinner, spray this on them from top to bottom and spare them the annoyance of being some little critter’s all-in buffet. Remember! Make sure to read all instructions and follow all directions printed on the label. Spray it on the outside of their clothing as spraying it on fabric rubbing against the skin may irritate. DEET-free repellents often have to be used more liberally, but still be aware of using the appropriate amount on your baby. Good luck and hope you successfully keep the nasties away!